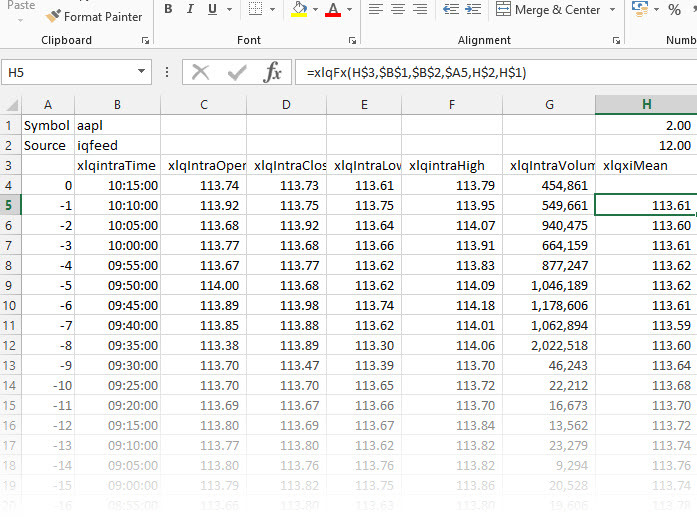 Intraday formulae allow you to work with historic tick or X minute bars of data. 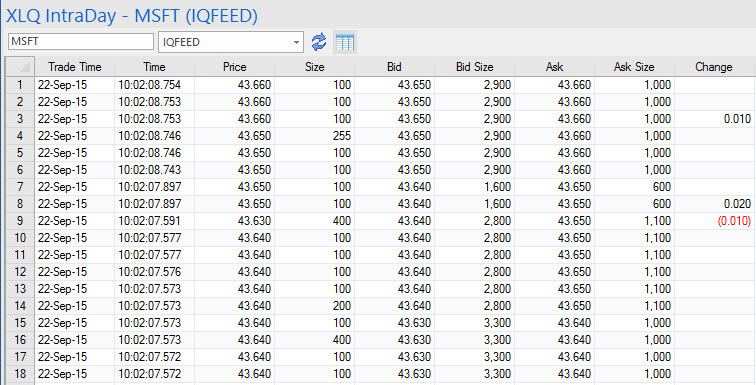 Backfill data will automatically be requested from the streaming source (IB, IQFeed and TDAmeritrade) and updated from the streams. Intraday data will also be logged from snapshot services. 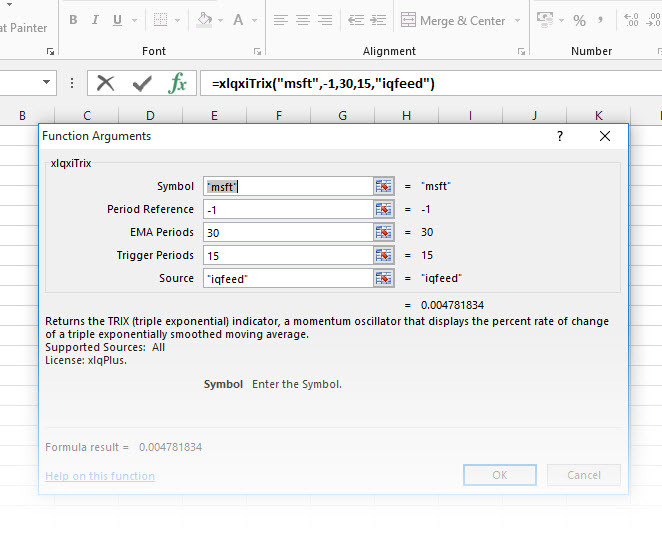 Intraday formulae will work on the frequency set in xlq preferences. Only when an X minute interval is chosen can xlqxi.. calculations be performed. 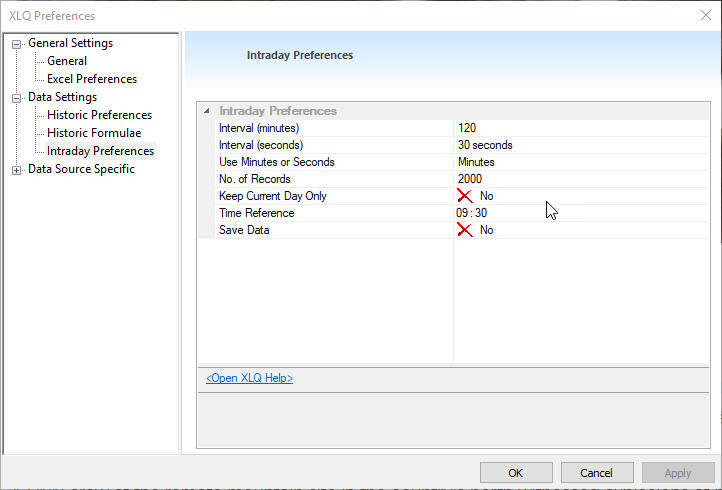 If the preference setting is changed xlq should be restarted to work with the new interval. From the data source specific preferences it is also possible to set source specific backfill settings such as restricting the backfill to certain times, or including only regular trading hours. Formulae returning basic data start with xlqIntra and require a sequence parameter. Calculated formulae start with xlqxi.. and may require additional parameters. All intraday formulae require a sequence parameter being a value starting from 0 (most recent), -1, -2 till -2000 (oldest). Depending on the preference setting they could represent ticks or x minute bars, e.g. if a 5 minute bar is chosen, 0 would be the current 5 minute bar, -1 the 5 minute before, -2 the 5 minutes before that. TrueStrengthIndex the True Strength Index. TrueStrengthSignal X period EMA of True Strength Index . TrueStrengthHistogram Difference between Index and Signal. UDVR the Up Down Volume Ratio. UDVRSlope Slope of the the Up Down Volume Ratio.